Added almost all configurable voice notifications that are available on Android. Some are available without a subscription. Heart-rate zone display now works proplery on all phones. Blackberry: delete button in text field no loger works like back button. In the past few days we made a couple of important updates to the way we display workout lists on sportypal.com to address most of the suggestions from our users. It’s one of the most visited pages (our users see it every time they log in to the site), so we decided to add some useful features and fix a couple of annoyances. First and foremost, indoor workouts are no longer shown on a separate page. Instead, all of your workouts – both indoor and outdoor – are now shown in the “Workouts” page. You may also notice the “Extras” column. 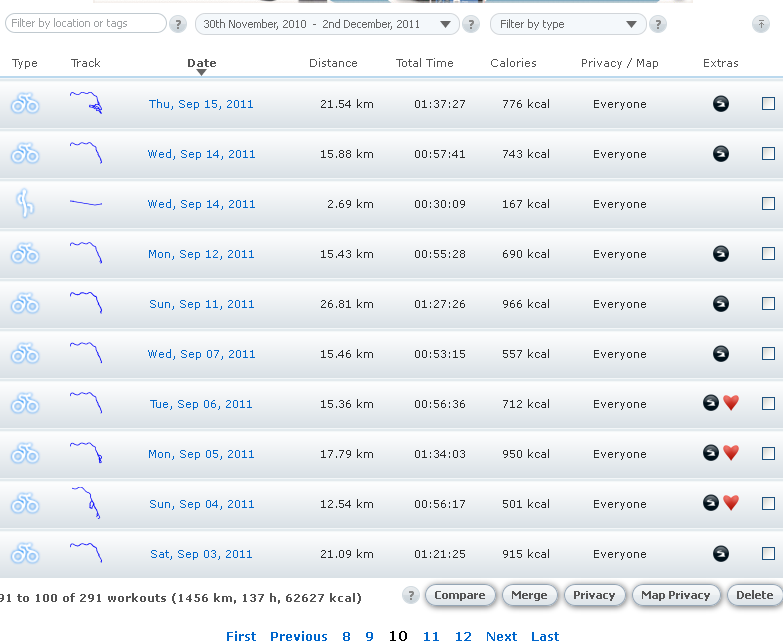 It contains icon indicators which tell you if the workout has a certain feature: currently, heart rate data or a track. Outdoor workouts now have 2 privacy settings: one for the workout itself, and an optional stricter one for the location on a map. To reflect this merge, the workout type filter has also been revamped to have both indoor and outdoor types. Unlike the previous filter, now you can select multiple workout types at the same time. It’s also smarter – it doesn’t show workout types which you haven’t used in the selected date range. Speaking of the date range, there are now two ways to change it: either by clicking the down-arrow and changing the slider points or by clicking directly on the dates and picking a date using the calendar. Additionally, this update will allow us to make the page size expandable soon. Edit: And here it is: the long awaited expanded page size. You can now toggle between viewing 5 or 10 workouts per page. We hope that you like the additions and changes that we made to this page. Stay tuned for more.